Performance has been considered the most energising type of art of the 20th century, nevertheless, today it is interpreted in a specific way, completely different than in the early 70’s. Further, at present it has been subject to commercial manipulation. A HUGE ABYSS between the commercial world’s pretending performance art and performance art itself is a certain fact. In my conversation with Fabio Cavallucci I heard an opinion that “performance art festivals present third rate artists and one does not have to keep searching for new performers, as the choice has already been made.” I decided to test this false statement expressed by Mr Cavallucci that questions the open nature of performance, during the festival in Piotrków Trybunalski. The festival of “third rate artists”, who are never perfect. Low-budget performance art festivals irritate commercial (and institutional) curators who are promoting performance celebrities according to their own scheme. The festival meetings always propose a whole variety of art, multiple contexts, openness and lack of compromise towards the way the world is evaluated. Here the creation of celebrities is false and banal. 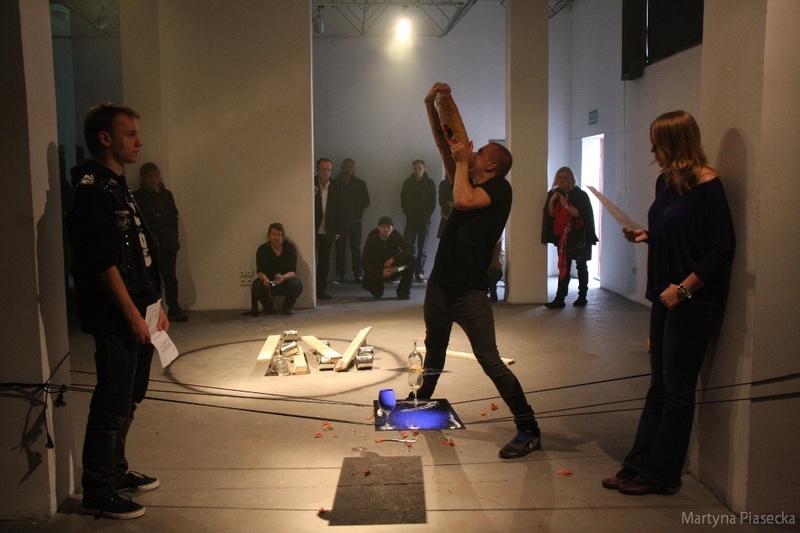 This entry was posted in Reviews and tagged Exit, fabio cavallucci, Interakcje, performance art on September 29, 2013 by malgosia1979. A new performance art festival on performers’ world map: OFFSCENICZNY Festival of Performative Activities (April 11-13th, 2013) in Czestochowa, Poland. Until very recently when we thought of “Czestochowa”, the concept of ‘contemporary art’ would be our very last association. Not without reason. Perhaps it would be better to forget about the artwork of Jerzy Duda-Gracz from Czestochowa and the Museum of Zdzislaw Beksinski is better avoided by each contemporary art lover who cares anything at all about art. As we look through the program of the Municipal Gallery in Czestochowa we can see what we have there: an exhibition entitled Contemporary landscape, an exhibition of the Drawing and Graphics Biennale from Kalisz, an exhibition entitled Landscape by Artur Śpiewak (painting) and an exhibition by two allegedly exceptionally talented but unknown artists produced in co-operation with the International Graphics Triennial Association in Krakow. The artists and their art are non-threatening, non-controversial, academic, aesthetic and even decorative. The exhibits do not conflict with the Holy Mary Sanctuary in Jasna Gora, which is close to the gallery. Neither do they conflict (unfortunately) with the giant figure of the former Pope which now stands in the park of sacral miniatures. At times we could say there are some similarities. What else is happening in contemporary art in Czestochowa? Well, the Art Department of the Jan Dlugosz Academy published a beautiful album about marine painters. The last time that cutting edge performance artists performed in the Municipal Gallery was in 1997 (Jan Świdziński, Marek Chołoniewski, Władysław Kaźmierczak, Piotr Wyrzykowski, Dariusz Fodczuk and Wojciech Kowalczyk). Does this mean that the only presence of performance art in Czestochowa should be the memory of that event and the fact that the artist Arti Grabowski studied here for a while? Does this mean that when the public would like to see contemporary art they must always have to buy a bus ticket to Warsaw, Krakow or at least nearby Bytom? No. This entry was posted in Reviews and tagged Anka Fugazi, Anka Fugazi Biernacka, Częstochowa, Dominik Złotkowski, OFFSCENICZNY, performance, performance art on May 23, 2013 by malgosia1979.